Welcome to the 2012 ESPN Insider ranking of the top 100 prospects in baseball. This is the fifth year I have done these rankings for ESPN, and for the first time I have the same player at No. 1 for the second straight year. Last year's Rule 4 draft was one of the deepest in recent memory, so there are plenty of new faces. A more detailed explanation of the process in determining these rankings is found at the top of each of the four player capsule pages. 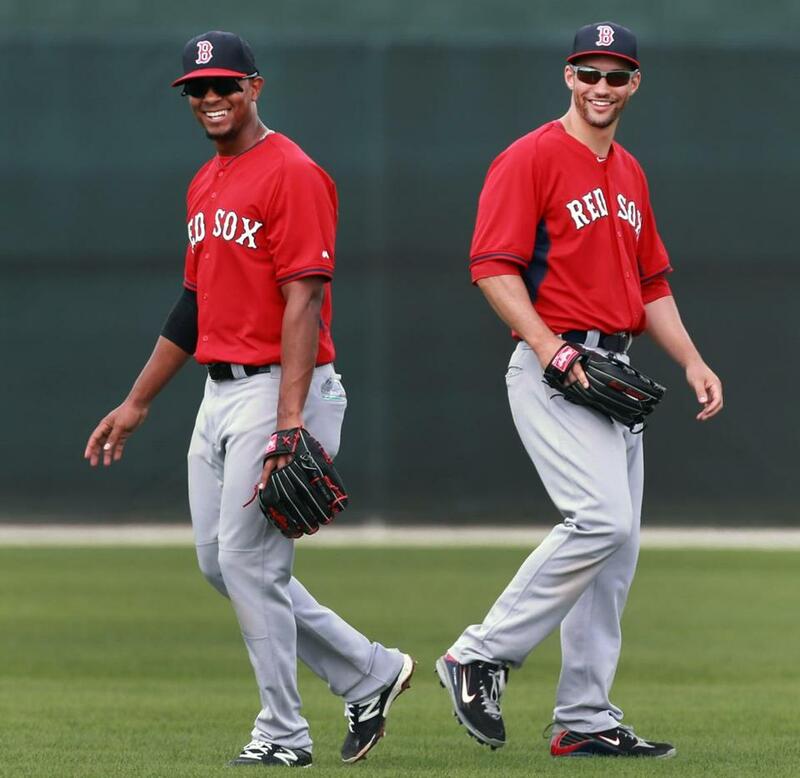 Rookie shortstop Xander Bogaerts (left) and veteran outfielder Grady Sizemore laugh during a popup drill. FORT MYERS, Fla. — He’s already won a World Series, now he gets to be Rookie of the Year. There is no slowing down for Xander Bogaerts, no warning track. Only the fast track. It’s hard to know where to start. The Red Sox have brought a lot of great players to the big leagues through the years. Few players had better career starts than Fred Lynn or Nomar Garciaparra, and we won’t insult anyone by bringing Ted Williams into this conversation. Ted forever will be the all-time greatest Red Sox and there was no shortage of hype when he burst into the big leagues in the spring of 1939. It’s always a mistake to expect too much. Bogaerts is only 21 years old and is bound to have slumps and struggles as he makes his way in his first full big league season. He is not a potential triple crown winner (Hanley Ramirez was) and we don’t know how he’ll fare as an everyday big league shortstop. But Bogaerts is as close to a sure thing as you are going to get in big league baseball. If he doesn’t blossom into an All-Star, it means that all scouting, all analysis, and Bill James-ian projection mean nothing. ESPN has declared Bogaerts the second-best prospect in all of baseball (Twins outfielder Byron Buxton got the top nod). The last Sox player who came to the big leagues with this much expectation was Roger Clemens, and Clemens wound up winning 192 games for Boston. Wow. Maybe somebody should name a field after Bogaerts. 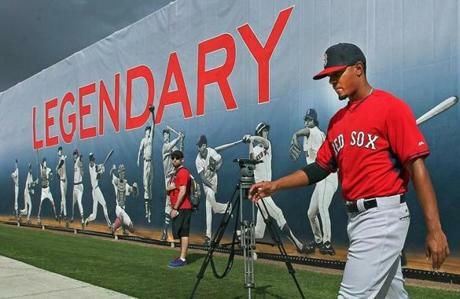 He may not be ready to hang on the wall with the Red Sox legends yet, but big things are expected for rookie shortstop Xander Bogaerts this season, and for many seasons to come. Oops. They’ve already done that near his home in Aruba. One of the elements that makes it easy to project stardom is the fact that we already have a real sample. Bogaerts came to the big leagues last August, the Sox’ first 20-year-old position player since Dwight Evans was rushed into the 1972 pennant race. Bogaerts hit .250 in 18 games. His only homer was one of the longest homers hit at Yankee Stadium in 2013. It got even better in the postseason. Playing third and a little short, he scored nine runs in 12 postseason games, compiling a .412 on-base percentage. He didn’t blink against the aces of Detroit and St. Louis and he demonstrated uncommon plate discipline for a youngster with limited professional experience. He hit a booming triple in St. Louis in Game 3, becoming the third-youngest player to hit a triple in a World Series game. The two who did it at a younger age were Ty Cobb and Mickey Mantle. Bogaerts’s seventh-inning single in Game 5 helped the Sox to a 3-1 victory. Bogaerts was creeping toward the middle of the batting order when the World Series ended. All he’s got to do now is take over as the everyday shortstop of the defending world champs. In his official rookie year (Bogaerts retains his rookie status because of his limited big league play in 2013). There’s been considerable noise about the Sox bringing back Stephen Drew and moving Bogaerts to third, but management backed away from Drew this past week and Bogaerts has been told to work at shortstop only. Bogaerts has been spared the playful abuse of Dustin Pedroia. The second baseman was tough on Jose Iglesias but has taken the kinder/gentler approach with Bogaerts. The degree of difficulty at shortstop is obvious, but Bogaerts has the additional “burden” of perhaps being “too big” for short. The Sox list him at 6 feet 3 inches and 185 pounds, but he says his height has been exaggerated. He sounds capable of dealing with ridiculous expectations.